…just flew by. Can’t believe it is Friday night and were did the time go? It was really nice and we even made it thru without a visit to Starship! We got lots done and currently our house looks like a wallpaper monster has thrown up, or at least that’s what Hamish’s FB status reckons! We are stripping wallpaper in Aria’s room and the hallway and stairs. It is lots of fun, well kinda, it’s getting a bit boring now. Aria is sleeping in the Wiggle Room which she thinks is pretty cool. Poppa asked her what colour she is going to paint her room and he waited for the answer ‘purple’. Strangely enough she replied Orange. She said Orange yesterday when I asked her too. Everything else is purple except her room, funny girl. Thank you for all your messages and comments re: my last post. We appreciate the encouragement and support, honestly it is great. Our faith is being tested but God is bring us thru. Stripping wallpaper has helped too! Blue- the colour of our mood lately. We are starting to struggle with the situation we find ourselves. We live in this awful limbo, waiting for the word to say we can leave for Omaha. There is also a long To Do list that we can’t start on until we have dates to leave. There is stress about what to do with all our things. Do we sell them or store them? Storage costs are huge although we have had offers. And we need to find tenants for our house which we can’t do without a move out date. Aria isn’t really well either which I guess is the reason it is so hard. She hasn’t bounced back from the Swine. Afternoons are good but in general she isn’t walking much and her energy seems low. She is also a pretty skinny at the moment. Clinic next week thankfully although I am dreading it and looking forward to it in equal parts. Basically it is a huge test of faith. Do I really believe that sentence at the top of this website you are reading? Do I really believe God has all plans in hand? Thanks to the wonder that is Facebook I have a dear friend in Texas who has brought huge encouragement to me. Lori has had a very tough time when her son Caed lost much of his intestine suddenly just days after their 3rd baby was born!! Caed is an amazing little boy and is Omaha’s Intestinal Rehab Rockstar! God has done a huge work in him. Lori is going to be in Omaha at the end of October so I really hoping we are there then!!! Anyway, if you click on the link you will read the most amazing prayer which impacted my soul deeply. God…in my limited understanding I want to cry out “WHY?”…….why did it come about this way? It wasn’t supposed to be like this! These are the words of Lori’s heart from God to God. Lori- I hope you don’t mind me posting them! !‘ And I love this- Lord…..I ask for You to cover me with PEACE. Peace that passes all understanding (just as you did before). I KNOW You are asking me to trust…..to just stop…..to rest in YOU!’ Isn’t that awesome, I must of sat for about half an hour and cried and prayed this over and over and prayed that it might be true in my heart. Gosh- I think this is turning into a long post. Finally, I went to the beautiful funeral of a great saint of God’s kingdom, Jenny Thompson who prayed for Aria all the time. We closed with the song ‘How Great is our God’ It is true, He is a great God who has done AMAZING things in our lives. We hold on or rather He holds on to us right now. 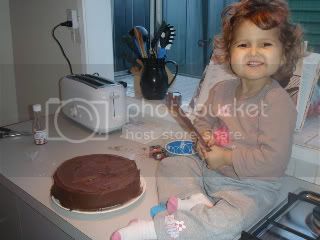 Here are some pics of Aria baking a chocolate cake today. 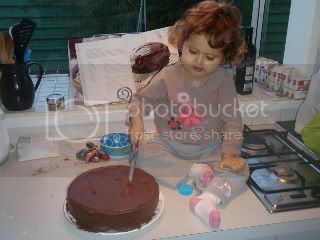 She loves chocolate and loves cooking so what better to bake than a chocolate cake. We had a great time and it was nice to do this with her. She was very proud of herself for making such a big yummy cake. She is doing a bit better today, the last week hasn’t been so flash. This is a photo Aria took, I thought it was pretty cool. Although I know ZERO about photography so my opinion doesn’t count for much! 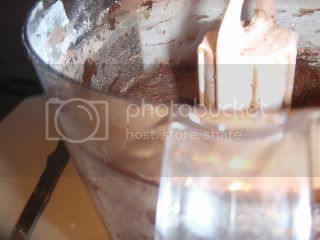 We are working on a new website, as you can see from these pics the main one on Aria’s site is a bit out of date. By ‘we’ I mean our web guru Daniel. It is pretty cool and will be up soon. I was doing wiggle juice with Aria tonight and I was talking with her about her day with mummy and Asher. I was asking if she had been a good girl today and had listened to mummy and done what mummy had asked her to. To my surprise she told me that she hadn’t. She then went on to tell me that she had hit Asher because he had been trying to take her playdough. I asked whether she had said sorry to Asher and she went all shy. I had a little talk to her about needing to be gentle and patient with Asher and what it is to be a good big sister and family and she listened well like she normally does. After I had Aria in bed I told Anita what she had said and asked what had happened. Anita then proceeded to tell me that Asher had been trying to ‘share’ some playdough that Aria was playing with and Aria was being a little bossy and naughty by pointing at him and saying loudly “No, Boomie!, No Boomie!”. Unfortunately Asher got a bit close and Aria knocked him on the nose. Asher was a bit shocked apparently and went to the other side of the room to have a sit down and gather his thoughts. Now this is the part I’m proud of, Aria, realising that she had hurt Asher (or his feelings at least) got up and walked across the room to find him, patted him on the head as she does and said “Sorry Boomie”. I’m so proud of her for saying sorry, even though the hit was really an accident. In other things to be proud of, today Aria was getting one of her dressings changed and asked Anita for a pillow, being busy with the dressing Anita wasn’t able to reach one. Then much to Anita’s surprise Asher came wandering in from the other room with a pillow for Aria. He then went and got one for himself and lay down next to Aria. Then Aria asked for a blanket and Asher went and got one of those too. Way to go Asher! I love my kids, they make me so proud sometimes! Aria went back to preschool this morning. She did really well. She was really good and not as much drama as last time. She was threading beads, looking at tadpoles, putting dots on her paper ballon, singing, holding up the E for the B.I.B.L.E song, stamping stamps on the ink pad and chuckling at the little girl dressed up as a Zebra as she ran past. Aria was really tired at the end and went home for a sleep which she doesn’t normally do. I was so relieved it went well cause I was pretty nervous this morning. Today is Hamish’s birthday. Aria reckons he is two which isn’t quite right We wrapped his present and Aria wrote in the card and let Asher write too. Aria announced it was a DVD as he was opening it which was quite funny. 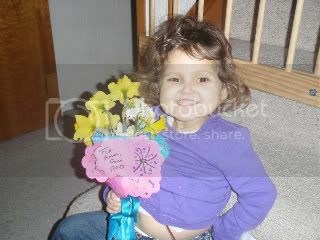 We are currently keeping up with a blog of a little girl Gwen who received a bowel transplant about 10 days ago. Her mum was posting about Gwen’s first night off TPN and how she was eating a banana and popiscle. Gwen is doing really well to be off TPN 10 days post transplant. We are very excited for her and hopeful for Aria and others. I can’t imagine Aria being off TPN after having it nearly every day of her little life. But it will come! Aria is so clever. She has figured out how to work my iPod touch without any help from us. Hamish and I went out and when we came home Aria was watching Wiggles clips off YouTube on the iPod. We asked Nana if she had helped and she said no. Aria had managed to unlock it and find the YouTube app and mostlikely went to the bookmarks. She is improving everyday. Her tummy is nice and small and soft still which is great. Hamish and I are getting lots of kisses and cuddles which is nice. Downside is that she isn’t up and walking much. It is hard to know if she is choosing not to or can’t. So she is lying down a lot and says ‘read book mummy’. We have been reading A LOT of books. But Asher isn’t really the sitting down type so it means it is difficult to split my time. Speaking of Asher, he is turning into a real boy. He is full of energy and loves to run around. But he is getting into mischief when I am on the couch reading to Aria. Today he climbed on the bench, opened and started munching on the entire 1kg block of cheese!! It has these bites marks all down it. Won’t be making anything with cheese for dinner guests anytime soon! Aria’s stomach continues to empty itself of the nasty brown gunge, I think by the end of today it would have been almost 2 litres since it started!! Last night was the best night we have had in awhile. No more waking up and yelling in pain although she did wake up and call out, perhaps it has become a bit of a habit. Aria has been up and walking around this morning so that is great! She is lying down now and Poppa is reading her books which she is pretty happy about. Aria loves books. Last night I managed to leave Aria for the last hour with our lovely carer Kerrianne and get into town to see Sam’s mum Shirley. We even left the hospital and walked down the road and had dinner out like regular people. It was pretty cool. We had lots to talk about. Shirley told me a bit about their life in Laos. Of course surviving hospital was a topic as was TPN. It was a really blessed time. I went to see Sam in PICU too before and after dinner. The consultant recognised me and we had a friendly chat. I was kinda surprised that she remembered me cause we were only there 3 days. Seeing Sam was really nice. He is so cute and looks a lot different than when we last saw him. He is a brave boy and did I mention he was cute? Last night was filled with adventure! Well not really but it felt like it!! Aria’s gut finally started to release some of the stuff it was holding. Overnight about 500mls of nasty brown liquid came out. Unfortunately her tube wasn’t flowing well so there was some vomiting, poor girl. Felt really bad for her. There is an impressive pile of washing today and Hamish and I are pretty tired. This is the very thing we had been praying for so we are really happy and feel relieved. Today hopefully she will improve more and start to get a bit more active. Lunchtime update: Aria is doing great Lots more brown junk coming out which is great. Better out than in! She has manage more sitting up and has been playing with her feet in her hands lying down, which she couldn’t of managed yesterday with a big sore belly in the way. Phew! We are so relieved- did I mention that?? She is now telling me we should ‘go upstairs right now for a bath’ Yay, have been trying to convince her all morning. We went to Covenant Presbyterian Church this morning. We decided to take Aria with us cause she was keen to come. We were also hoping moving her around more would get that gas out of her tummy. Currently she is just lying down all the time. Turns out she couldn’t really manage sitting for more than about ten minutes. So Nana took her for a walk outside the church and eventually home just after Hamish and I finished our presentation. Nana comes to the rescue again. We are planning to clone her and take a Christine 2.0 to Omaha with us. Hamish and I shared with Covenant our plans for Omaha and Aria’s future. We were a bit flustered because Asher was also running around like a maniac as he does cause that is what boys do. We said everything we wanted to say. There were lots of tears although I didn’t notice anyone else’s but mine. On our last slide it was my job to say THANKS, but I couldn’t manage so overwhelmed was I. There were over 150 people pretty much all of them have supported us in some way. After people greeted us with misty eyes and hugs and ‘we are praying for you’. We were really grateful and I decided tears are often an effective way of communicating cause sometimes there are no words. We also shared a little bit about Samuel. We didn’t check the blog before we left but he is having a hard time, as is his mum and dad. He is in PICU at the moment. We know how that is and it is rough. Please pray for him. Strangely enough we feel Aria is actually pretty well but she keeps saying ‘sore tummy’. In herself she is laughing and talking. But can’t sit or walk much. Not really sure what to do. The only obvious way to move the gas is to give her a wash out under GA which seems extreme but her life currently is fairly rubbish. We are hoping it clears naturally and soon. Yesterday Asher went to daycare and Aria and I were home. It was a pretty difficult day, she wasn’t well and was quite demanding. Not sick enough for me to think she should be in hospital but just not right either. By the end of the day I was pretty upset and overwhelmed and just feeling bad for Aria and that her life is so difficult. We are just so desperate to Aria to be well again. Until she is it is difficult for her and difficult for us. But God gives us the ability to cope with each day and hope that tomorrow might be different. But if it isn’t there is still the promise of strength. Today, actually, Aria is a bit brighter. She requested a sandwich and is currently telling us how yummy it is as it sits fully intact on her plate. She has managed to sit up for a bit and play and is doing plenty of talking. The past days and weeks have been tough. I found myself becoming angry and resentful of our situation and asking lots of big questions. But that’s not trusting God. I was challenged afresh to Trust Him really really commited Aria’s life to him and really believe He is doing the right thing. And admitting I am just human and He is God. Hamish is preaching tomorrow and we are presenting a power point on the next leg of our journey with Aria at Covenant Presbyterian tomorrow. We are looking forward to it and hope we might encourage the people there who have been so supportive of Aria and our family.